The utility of platelet-rich plasma (PRP) has spanned various fields of dermatology from chronic ulcer management to trichology and aesthetics, due to its role in wound healing. Though PRP is being used over a long time, there is still confusion over proper terminology to define, classify and describe the different variations of platelet concentrates. There is also a wide variation in the reported protocols for standardization and preparation of PRP, in addition to lack of accurate characterization of the tested products in most articles on the topic. Additionally, the high cost of commercially available PRP kits, precludes its use over a larger population. In this article, we review the principles and preparation methods of PRP based on available literature and place our perspective in standardizing a safe, simple protocol that can be followed to obtain an optimal consistent platelet yield. Marx proposed that platelet count of 10 lakh/ml in 5 mL of PRP, as a working definition of PRP, based on the scientific proof of bone and soft tissue healing enhancement. There is a scarcity of studies stating the concentration at which optimal stimulation occurs. Rughetti et al. studied the relationship between the concentration of platelets in platelet gel and changes in the functional activity of human endothelial cells. The proliferation of endothelial cells and its migration and the invasion of endothelial cells occurred in a bell-shaped manner. The authors found that the stimulation for proliferation of endothelial cells peak at 1.25 × 10 6 and angiogenesis at 1.5 × 10 6 platelets/mL, respectively. This signifies the fact that a PRP platelet count 1 million/mL has become the working definition for therapeutic PRP and also reasons out the criticism on not getting the expected best results of PRP, which might be due to lower concentrations of platelets. The literature on PRP is considerable, but the published results are often contradictory. It is very difficult to sort and interpret the available data, due to a large number of preparation techniques, terminologies, forms of these materials, and the endless list of potential applications. Pure Platelet-Rich Plasma (P-PRP) or leucocyte-poor PRP products are preparations without leucocytes and with a low-density fibrin network after activation. Leucocyte- and PRP (L-PRP) products are preparations with leucocytes and with a low-density fibrin network after activation. It is in this family that the largest number of commercial or experimental systems exist. Particularly, many automated protocols have been developed in the last years, requiring the use of specific kits that allow minimum handling of the blood samples and maximum standardization of the preparations. Pure platelet-rich fibrin (P-PRF) or leucocyte-poor platelet-rich fibrin preparations are without leucocytes and with a high-density fibrin network. These products only exist in a strongly activated gel form, and cannot be injected or used like traditional fibrin glues. Leucocyte- and platelet-rich fibrin (L-PRF) or second-generation PRP products are preparations with leucocytes and with a high-density fibrin network. PRP is obtained from a sample of patients' blood drawn at the time of treatment. A 30 cc venous blood draw will yield 3-5 cc of PRP depending on the baseline platelet count of an individual, the device used, and the technique employed. The blood draw occurs with the addition of an anticoagulant, such as citrate dextrose A to prevent platelet activation prior to its use. The authors employ a specialized 'table top cold centrifuge' device. Preparation-related costs are significantly lower than with commercial kits. PRP is prepared by a process known as differential centrifugation. In differential centrifugation, acceleration force is adjusted to sediment certain cellular constituents based on different specific gravity. There are many ways of preparing PRP. It can be prepared by the PRP method or by the buffy-coat method. In the PRP method, an initial centrifugation to separate red blood cells (RBC) is followed by a second centrifugation to concentrate platelets, which are suspended in the smallest final plasma volume. In [Figure 1], flow chart describes a double centrifugation process of PRP. WB (whole blood) is initially collected in tubes that contain anticoagulants. The first spin step is performed at constant acceleration to separate RBCs from the remaining WB volume. After the first spin step, the WB separates into three layers: an upper layer that contains mostly platelets and WBC, an intermediate thin layer that is known as the buffy coat and that is rich in WBCs, and a bottom layer that consists mostly of RBCs. For the production of pure PRP (P-PRP), upper layer and superficial buffy coat are transferred to an empty sterile tube. For the production of leucocyte rich PRP (L-PRP), the entire layer of buffy coat and few RBCs are transferred. The second spin step is then performed. 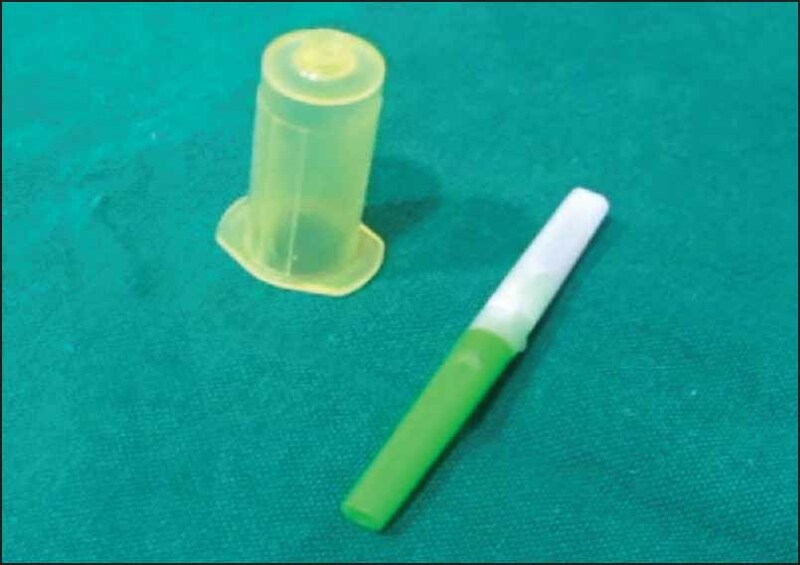 'g' for second spin should be just adequate to aid in formation of soft pellets (erythrocyte-platelet) at the bottom of the tube. The upper portion of the volume that is composed mostly of PPP (platelet-poor plasma) is removed. Pellets are homogenized in lower 1/3rd (5 ml of plasma) to create the PRP (Platelet-Rich Plasma). In the buffy coat method, whole blood (WB) is centrifuged at a 'high speed' with subsequent collection of the buffy coat. A buffy coat contains high concentration of leucocytes. From small volume of WB (10 mL), a very thin layer of a buffy coat can be produced. The difficulty lies in separating this thin buffy coat layer that contains mainly white blood cells (WBCs) and platelets, from the underlying RBC layer. Do not chill the blood at any time before or during platelet separation. Centrifuge the blood using a 'soft' spin. Transfer the supernatant plasma containing platelets into another sterile tube (without anticoagulant). Centrifuge tube at a higher speed (a hard spin ) to obtain a platelet concentrate. The lower 1/3 rd is PRP and upper 2/3 rd is platelet-poor plasma (PPP). At the bottom of the tube, platelet pellets are formed. Remove PPP and suspend the platelet pellets in a minimum quantity of plasma (2-4 mL) by gently shaking the tube. WB should be stored at 20°C to 24°C before centrifugation. Centrifuge WB at a 'high' speed. Three layers are formed because of its density: The bottom layer consisting of RBCs, the middle layer consisting of platelets and WBCs and the top PPP layer. Remove supernatant plasma from the top of the container. Transfer the buffy-coat layer to another sterile tube. Centrifuge at low speed to separate WBCs or use leucocyte filtration filter. There are many PRP systems commercially marketed, which facilitate the preparation of ready to apply platelet-rich suspensions in a reproducible manner. All operate on a small volume of drawn blood (20-60 mL) and on the principle of centrifugation. These systems differ widely in their ability to collect and concentrate platelets depending on the method and time of its centrifugation. As a result, suspensions of different concentration of platelets and leucocytes are obtained. Differences in the concentrations in platelets and WBCs influence the diversity of growth factors concentration. It is difficult to assess which kit for PRP preparation is better and which is worse. PRP is prepared by centrifugation varying the relative centrifugal force, temperature and time. It has been seen that the two-step procedure renders the highest output. There are numerous protocols in the current literature that describe the optimal conditions for centrifugation [Table 2]. However, these various protocols have been optimized with respect to different variables of the process, such as volume and sampling of processed WB, number of spins, time period of centrifugation, and range of centrifugal acceleration. Considering the complexity of an autologous product such as PRP and the need for quality control in clinical applications, it is crucial to demonstrate procedure's ability to reproduce consistent results. Despite these variations, all protocols follow a generic sequence that consists of blood collection, an initial centrifugation to separate RBCs, subsequent centrifugations to concentrate platelets, and other components and an activation of the sample by adding a platelet agonist. Amable et al. studied variations in relative centrifugal force (RCF), temperature, and time for optimizing conditions for platelet isolation and quantification of cytokines and growth factors in PRP before and after platelet activation. Peripheral blood from 22 healthy male and female volunteer donors (20-54 years old) was collected using 4.5 mL blood collection tubes containing 0.5 mL citrate solution (VacutainerW, Ref: 369714; BD Biosciences). Blood samples were run by choosing RCF from 240 to 400×g, time from 8 to 19 min and temperature from 8° to 16°C. All steps were performed in a refrigerated centrifuge (certified Jouan Br4i, Saint-Herblain, Loire-Atlantique, France). Amanda et al. demonstrated that the processing of 3.5 mL of blood at 100×g for 10 min (1 st spin), 400×g for 10 min (2 nd spin) and withdrawing 2/3 of remnant plasma, promoted high platelet recovery (70%-80%) and concentration (5×) maintaining platelet integrity and viability. Authors believe that time and acceleration are the fundamental parameters that define the composition of the PRP sample after the first spin step. Longer time periods slightly increased platelet recovery and decreased the concentrations of WBC in the upper layer. Therefore, time could be a control parameter when low levels of WBC, such as granulocytes and lymphocytes, are required in the PRP sample. Various factors contribute to platelet concentration gradient such as the size of platelets, the biological difference among individuals and hematocrit variability. Kahn et al. determined that a centrifugal acceleration of 3731×g for a period of 4 min was the optimal condition for obtaining the highest platelet concentration from 478 mL of WB. The highest platelet recovery efficiency obtained by Slichter and Harker  was 80%, using a sample of 250-450 mL of WB centrifuged at 1000×g for a period of 9 min. It was observed that a subsequent centrifugation step of 3000×g for a period of 20 min decreased the platelet viability. Tamimi et al. compared two methods for obtaining PRP: Double centrifugation (ACE system; Surgical Supply and Surgical Science Systems, Brockton, MA, USA) and single centrifugation (Nahita System; Nahita, Navarra, Spain). Three test tubes of 8.5 mL WB each were introduced into an ACE centrifuge machine and subjected to a force of 160×g (1300 rpm) for 10 min. For second centrifugation, 400×g force (2000 rpm) for 10 min was applied. For Nahita system blood was extracted into 3.5-mL citrated tubes (Venojet; Terumo MR, Tokyo, Japan) containing 0.5 mL of trisodium citrate, citrate, and ACD as anticoagulants. Test tubes were centrifuged with a 280×g force (1500 rpm) for 7 min. Platelet concentration from the ACE and Nahita systems were (336%) and (227%), respectively. Mazzocca et al. analyzed three protocols for preparing PRP samples with different compositions: A low platelet (382 × 10 3 /mm 3 ) and low WBC (0.6 × 10 3 /mm 3 ) process with one spin step at 1500 rpm for 5 min (10 mL WB); a high platelet (940 × 103/mm 3 ) and high WBC (17 × 103/mm 3 ) process with one spin step at 3200 rpm for 15 min (27 mL WB); and a double-spin process (1500 rpm for 5 min and 6300 rpm for 20 min) that produced a higher platelet concentration (472 × 103/mm 3 ) and lower WBC (1.5 × 103/mm 3 ). Anitua et al. used only one centrifugation spin step and collected the volume immediately above the erythrocyte layer. Blood was collected on sterile tubes (4.5 mL) containing 3.8% (w/v) trisodium citrate, then centrifuged at 460×g for 8 min (PRGF System1, B.T.I. Biotechnology Institute, Vitoria-Gasteiz, Spain). 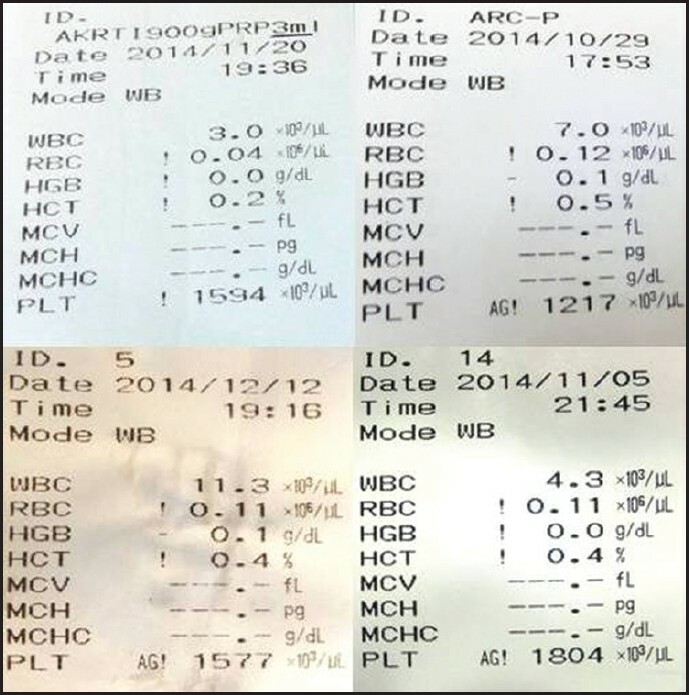 This protocol obtained a platelet concentration factor of 2.67 above the baseline value. Dugrillon et al. reported that the number of platelets is not always proportional to the growth factors' quantity, so more attention should be given to the quality of PRP than to the number of platelets concentrated. Their study proved that the TGF-β1 and platelet concentration are proportionally related to the centrifugation forces when the forces are less than 800×g. TGF-β1 becomes inversely related to the centrifugal force when forces are above 800×g. Araki et al. concluded that optimized protocol for PRP preparation was centrifugation of WB at 230-270×g for 10 min, which also contained a low number of WBCs (4.1%-5.8% of WB). WBCs appeared to be precipitated when the centrifugation force was ≥840×g. In their protocol, WB (40-72 mL) was drawn by venipuncture, collected, and divided into 7.5-mL aliquots in 15-mL conical tubes and centrifuged conical tubes (15 mL; BD Falcon) . Tubes were centrifuged at 20°C in a refrigerated centrifuge (Kubota 5900; Kubota Co.). For the second spin step, an acceleration of 2300×g for 10 min was applied. The platelet concentration factor was 7.4 times greater than the baseline after removing approximately 1/10 of the PPP and adding ethylenediaminetetraacetic acid (EDTA) as an anticoagulant. Many other studies , specified centrifugal accelerations in rotations per minute (rpm) instead of in ×g, complicating the task of comparing and reproducing their results. In a recent study by Kececi et al.,  the first spin (soft spin) protocol was chosen as 250-270×g for 10 min. At the second spin, centrifugation force was varied from 300×g, 500×g, 750×g, 1000×g, 1500×g and 2000×g for 10 min. The platelet concentration factor increased as the centrifugal force of the second spin increased as 1.92-fold, 2.16-fold, 2.80-fold, 3.48-fold, 3.67-fold, and 3.76-fold after a 10-min second centrifugation at 300×g, 500×g, 750×g, 1000×g, 1500×g and 2000×g, respectively. The authors opined that obtaining a definite platelet concentration might be possible by adjusting centrifugation force individually according to the personal baseline value. There are various protocols described in the literature for preparation of PRP. Centrifugal acceleration, number of spins, time and distance between the particles and the rotor to the volume of processed WB are critical for optimization of PRP. Each laboratory must standardize its protocol. A handmade standard PRP could be prepared reliably and cost effectively without using a commercial kit. The platelet concentration factor can be changed with the centrifugation force applied in PRP preparation. Various factors influence the yield of PRP such as draw of blood; speed, time and temperature of centrifugation and use of anticoagulants. In a study by Waters and Roberts. using two cell-salvage devices and two table top devices over the course of 260 clinical cases, they found that there was a downward trend in platelet counts with longer draw time. The earth's gravitational force is sufficient to separate many types of particles over time. A tube of anti-coagulated WB left standing on a bench top will eventually separate into plasma, RBC and WBC fractions. However, the length of time required precludes this manner of separation for most applications. In addition, the potential degradation of biological compounds during prolonged storage means faster separation techniques are needed. Hence, to accelerate sedimentation, the effect of gravity is amplified using 'centrifugal force' provided by a centrifuge and can be many thousand times the force of gravity. Separation of cellular constituents within blood can be achieved by a process known as differential centrifugation. In differential centrifugation, acceleration force is adjusted to sediment certain cellular constituents and leave others in suspension. In centrifugation, RCF is the force required to separate two phases, this force also called relative centrifugal field. It is expressed as multiples of the earth's gravitational field (g). By accelerating the g, speedy sedimentation can be achieved. Where 'g' is the RCF, R is the radius of the rotor (from centre of rotor to sample) in centimetres and S is the speed of the centrifuge in revolutions per minute. It is important to remember that calculation of RCF is dependent on the radius of the centrifuge rotor used. The same centrifuge machine with different rotors can produce different acceleration forces. Macey et al. also stated that cooling may retard platelet activation and this may be essential in obtaining PRP with viable platelets. Many authors have used a temperature level of 12°C-16°C during centrifugation for best platelet recovery. This is germane to those who use an ordinary centrifuge to develop PRP, which are mainly developed for diagnostic purposes and not for PRP processing and hence may not produce a sufficient platelet yield. The importance lies in choosing an anticoagulant capable of preserving the platelets' best possible functionality, integrity, and morphology. Once PRP is activated, (fibrinogen-fibrin) a fibrin network begins to form, solidifying the plasma and creating a fibrin clot or membrane. The clinician needs to determine how much PRP he would need to generate for the particular procedure. As previously stated, many factors influence PRP yield. The following points are helpful in obtaining an optimum PRP concentrate. Draw blood in anticoagulant vacutainer tubes using BD Eclipse™ blood collection needle (Ref: 368607; BD Biosciences, India) [Figure 2]. Set apart 1-2 mL for baseline cell counting including RBCs, platelets, WBCs and hematocrit. Donor percent hematocrit (the ratio of the volume of RBCs to the total volume of blood) is relevant to plasma yield optimization. Blood with a low percent hematocrit has more plasma available thereby diluting the concentration of platelets in plasma. Blood samples that are collected in ACD tubes should be inverted 5-10 times for proper mixing of the anticoagulant and blood. If the tube is not mixed, small fibrin clots may form, causing a falsely decreased platelet count. After 1 st spin, measure the platelet count in RBCs and the supernatant to ensure optimal separation of platelets from the WB. If this does not happen, change the parameters like rpm and time. After first spin, if large volume of plasma is obtained, then it would need higher 'g' to concentrate platelets at the bottom of the tube (law of velocity). After 2 nd spin, measure the platelet count in PPP and PRP after adequately racking the tubes. If higher concentration of platelets in platelet poor plasma (upper layer) or lower concentration in PRP (bottom layer) is observed, then the parameters are not optimal. To obtain a yield of platelet in PRP more than 10 lakhs/mL, all variables like rpm, time and temperature should be standardized and also consistency of platelet concentrate has to be maintained over the period After several attempts with various permutations & combinations, the authors found that at 900g x 5 mins for 1st centrifugation and 1000g x 10 mins for 2nd centrifugation at 16° C in a refrigerated centrifuge (RemiCM8plus; Remiworld, India), the PRP yield was found to be optimum. Authors have consistently recorded platelet count exceeding 10 lakhs/ml using these parameters [Figure 3]. 0The utility of PRP is increasing in the field of dermatology and aesthetics. Though commercially marketed PRP systems offer ready-to-apply platelet-rich suspensions in a sterile manner, high cost, limited volume of drawn blood, differences in centrifugation guidelines, wide variation in platelet concentration, makes it difficult for the clinician to choose amongst the readily available PRP kits. There are many protocols for preparation of PRP each having its own standardized parameters and claimed results, as mentioned in the review. It is advisable to standardize individual preparation protocols, which are cost-effective and easy to adapt in clinical settings. Understanding of basic principles of centrifugation is of paramount importance in preparation of PRP. Repeated methodology trials by 'trial and error approach', strict vigilance at maintaining sterility and regular cross-checking of the platelet values are a must to obtain consistent results. Conley CL. Hemostasis. In: Mountcastle VB, editor. Medical Physiology. St. Louis: The C.V. Mosby Company; 2004. p. 1137-46. Harrison P, Cramer EM. Platelet alpha-granules. Blood Rev 1993;7:52-62. Schliephake H. Bone growth factors in maxillofacial skeletal reconstruction. Int J Oral Maxillofac Surg 2002;31:469-84. Cole BJ, Seroyer ST, Filardo G, Bajaj S, Fortier LA. Platelet-rich plasma: Where are we now and where are we going? Sports Health 2010; 2:203-10. Kevy SV, Jacobson MS. Comparison of methods for point of care preparation of autologous platelet gel. J Extra Corpor Technol 2004;36:28-35. Antoniades HN, Williams LT. Human platelet-derived growth factor: Structure and functions. Fed Proc 1983;42:2630-4. Marx RE. Platelet-rich plasma (PRP): What Is PRP and What Is Not PRP? Implant Dent 2001;10:225-8. Rughetti A, Giusti I, D′Ascenzo S, Leocata P, Carta G, Pavan A, et al. Platelet gel-released supernatant modulates the angiogenic capability of human endothelial cells. Blood Transfus 2008;6:12-7. Dohan Ehrenfest DM, Bielecki T, Mishra A, Borzini P, Inchingolo F, Sammartino G, et al. In search of a consensus terminology in the field of platelet concentrates for surgical use: Platelet-rich plasma (PRP), platelet-rich fibrin (PRF), fibrin gel polymerization and leukocytes. Curr Pharm Biotechnol 2012;13:1131-7. Sweeny J, Grossman BJ. Blood collection, storage and component preparation methods. In: Brecher M, editor. Technical Manual. 14th ed. Bethesda MD: American Association of Blood Banks (AABB) 2002;955-8. Welsh WJ. Autologous platelet gel: Clinical function and usage in plastic surgery. Cosmetic Derm 2000;11:13-9. Scherer SS, Tobalem M, Vigato E, Heit Y, Modarressi A, Hinz B, et al. Non-activated versus thrombin-activated platelets on wound healing and fibroblast-to-myofibroblast differentiation in vivo and in vitro. Plast Reconstr Surg 2012;129:46e-54e. Platelet Rich Plasma (PRP) Guidelines, © International Cellular Medicine Society - 2011. Available from: http://www.cellmedicinesociety.org. [Last accessed 2014 Dec 5]. Marlovits S, Mousavi M, Gabler C, Erdös J, Vécsei V, et al. A newsimplified technique for producing platelet-rich plasma: A short technical note. Eur Spine J 13:102-06. Waters JH, Roberts KC. Database review of possible factors infuencing point-of-care platelet gel manufacture. J Extra Corpor Technol 2004;36:250-4. Lozada JL, Caplanis N, Proussaefs P, Willardsen J, Kammeyer G. Platelet-rich plasma application in sinus graft surgery: Part I--background and processing techniques. J Oral Implantol 2001;27:38-42. Han B, Woodell-May J, Ponticiello M, Yang Z, Nimni M. The effect of thrombin activation of platelet-rich plasma on demineralized bone matrix osteoinductivity. J Bone Joint Surg Am 2009;91:1459-70. Amable PR, Carias RB, Teixeira MV, da Cruz Pacheco I, Corrêa do Amaral RJ, Granjeiro JM, et al. Platelet-rich plasma preparation for regenerative medicine: Optimization and quantification of cytokines and growth factors. Stem Cell Res Ther 2013;4:67. Perez AG, Lana JF, Rodrigues AA, Luzo AC, Belangero WD, Santana MH. Relevant aspects of centrifugation step in the preparation of platelet-rich plasma. ISRN Hematol 2014;2014:176060. Kahn RA, Cossette I, Friedman LI. Optimum centrifugation conditions for the preparation of platelet and plasma products. Transfusion 1976;16:162-5. Slichter SJ, Harker LA. Preparation and storage of platelet concentrates. I. Factors influencing the harvest of viable platelets from whole blood. Br J Haematol 1976;34:395-402. Landesberg R, Roy M, Glickman RS. Quantification of growth factor levels using a simplified method of platelet-rich plasma gel preparation. J Oral Maxillofac Surg 2000;58:297-301. Jo CH, Roh YH, Kim JE, Shin S, Yoon KS. Optimizing platelet-rich plasma gel formation by varying time and gravitational forces during centrifugation. J Oral Implantol 2013;39:525-32. Bausset O, Giraudo L, Veran J, Magalon J, Coudreuse JM, Magalon G, et al. Formulation and storage of platelet-rich plasma homemade product. Biores Open Access 2012;1:115-23. Montalvo S, Tresguerres I, Tamini FM, Blanco Jerez L. A comparative study of 2 methods for obtaining platelet rich plasma. J Oral Maxillofac Surg 2007;65:1084-93. Anitua E, Aguirre JJ, Algorta J, Ayerdi E, Cabezas AI, Orive G, et al. Effectiveness of autologous preparation rich in growth factors for the treatment of chronic cutaneous ulcers. J Biomed Mater Res B Appl Biomater 2008;84:415-21. Dugrillon A, Eichler H, Kern S, Klüter H. Autologous concentrated platelet-rich plasma (cPRP) for local application in bone regeneration. Int J Oral Maxillofac Surg 2002;31:615-9. Araki J, Jona M, Eto H, Aoi N, Kato H, Suga H, et al. Optimized preparation method of platelet-concentrated plasma and noncoagulating platelet-derived factor concentrates: Maximization of platelet concentration and removal of fibrinogen. Tissue Eng Part C Methods 2012;18:176-85. Fernández-Barbero JE, Galindo-Moreno P, Ávila-Ortiz G, Caba O, Sánchez-Fernández E, Wang HL. Flow cytometric and morphological characterization of platelet-rich plasma gel. Clin Oral Implants Res 2006;17:687-93. Su CY, Kuo YP, Nieh HL, Tseng YH, Burnouf T. Quantitative assessment of the kinetics of growth factors release from platelet gel. Transfusion 2008;48:2414-20. Kececi Y, Ozsu S, Bilgir O. A cost-effective method for obtaining standard platelet-rich plasma. WOUNDS 2014;26:232-8. Bentleys textbook of pharmaceutics -An update, Sanjay Kumar Jain, Vandana Soni, 1st edition, 2014; Chapter 17:556-65. Macey M, Azam U, McCarthy D, Webb L, Chapman ES, Okrongly D, et al. Evaluation of the anticoagulants EDTA and citrate, theophylline, adenosine, and dipyridamole (CTAD) for assessing platelet activation on the ADVIA 120 hematology system. Clin Chem 2002;48:891-9. Anitua E, Prado R, Sánchez M, Orive G. Platelet-rich-plasma: Preparation and formulation. Oper Tech Orthop 2012;22:25-32. Callan MB, Shofer FS, Catalfamo JL. Effects of anticoagulant on pH, ionized calcium concentration, and agonist-induced platelet aggregation in canine platelet-rich plasma. American journal of veterinary research 2009;70:472-7. doi:10.2460/ajvr.70.4.472. Guder WG, Narayanan S, Wisser H, Zawta B. Special Aspects of Haematological Analysis: Diagnostic Samples: From the Patient to the Laboratory: The Impact of Preanalytical Variables on the Quality of Laboratory Results. 4 th ed. Wiley - Blackwell Publications, 2009; pg. 36-7. Woodell-May JE, Ridderman DN, Swift MJ, Higgins J. Producing accurate platelet counts for platelet rich plasma: Validation of a hematology analyzer and preparation techniques for counting. J Craniofac Surg 2005;16:749-59.